This is the feast of the first of the eighteen apparitions of the Blessed Virgin Mary to a little fourteen-year-old French girl in southern France, in 1858. The name of the little girl was Marie Bernadette Soubirous. The first of Our Lady’s apparitions to her was on 11th February. The last was on 16th July, the feast of Our Lady of Mount Carmel. The greatest was on 25th March, the feast of the Annunciation. 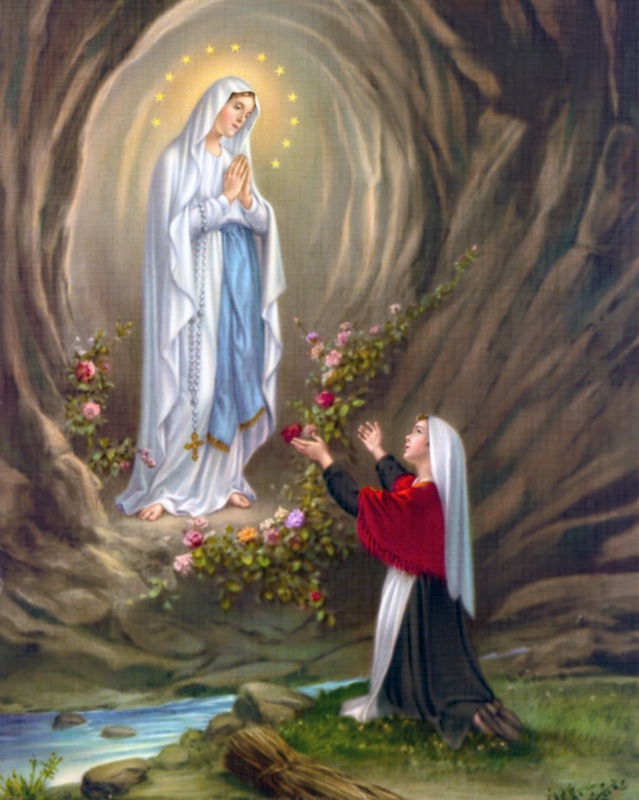 The Mother of God, on 25th March, said to Saint Bernadette, in keeping with the doctrine defined four years before by Pope Pius IX, affirming that she had been immaculately conceived, not “I was immaculately conceived,” but “I AM THE IMMACULATE CONCEPTION,”thereby letting us know that she was God’s very notion of this grace from all eternity. On Thursday, 11th February 1858, a week before Lent would begin that year on Ash Wednesday, a fourteen-year-old Bernadette Soubirous was out gathering firewood with her sister Toinette and a friend at the grotto of Massabielle outside Lourdes. There, she had the first of 18 visions of what she termed “a small young lady”, not in French but in the regional Occitan: uo petito damizelo, standing in a niche in the rock. Her sister and the friend stated that they had seen nothing. On realising that she alone, and not her companions, had seen the apparition, Bernadette asked her sister not to tell anyone what had happened. Toinette, however, was unable to keep silent, and told their mother, Louise Soubirous. Because their mother had suspected the children were lying, both girls received a beating, and Soubirous was forbidden to return to the grotto again. A few days passed and Soubirous asked for permission to go again with her siblings and the permission was granted. Our Lady did not speak to Bernadette until the third appearance, and therefore her identity was a matter of considerable speculation among the townspeople. On her third visit, she said that the “beautiful lady” asked her to return to the grotto every day for 15 days. At first her mother had forbidden her to go, but Bernadette persuaded her mother to allow her. She related that the lady told her that she did not promise to make her happy in this world, but in the next. At the fourth apparition, and instigated by the townsfolk who continued to be uncertain of the provenance of the apparition, Bernadette carried a lighted candle. This originated the custom of carrying lighted candles to the grotto. But at the fifth apparition on 20th February Bernadette reported later that the lady had taught her a prayer, which she said every day of her life, but never wrote down or repeated to anyone. By this time the news was spreading further afield and many people now assumed that Bernadette’s lady was the Virgin Mary. Over 100 people were present at the sixth apparition the next day, and the lady said to her: “You will pray to God for sinners.” At the seventh apparition Bernadette said later that the lady had told her a secret, which was only for her alone; this secret was never revealed to anyone. The message of the lady at the eighth apparition on 24th February was: “Penance! Penance! Penance! Pray to God for sinners! Kiss the ground as an act of penance for sinners!” This plea from the Mother of God for our penance and prayer for sinners is one of the most fundamental messages of Lourdes. Bernadette was interrogated again. The spring reportedly began to flow a day later. Increasingly large crowds were gathering at the grotto. There were almost 1,500 people present at the twelfth apparition of Our Lady on 1st March, but the lady had still not revealed her identity to the young girl. Local housewife Catherine Latapie, nine months pregnant, who had a paralysis of the ulnar nerve in one arm following an accident, reported regaining full movement after bathing her arm in the spring that day. “Go, tell the priests to come here in procession and to build a chapel here”, the lady told Bernadette on 2nd March. Accompanied by her two aunts, she went to ask the parish priest, Father Peyramale; he forbade her to go to the grotto, and dismissed her. Peyramale had ordered the priests to have nothing to do with the grotto, for it was the general practice of the clergy to discourage religious visionaries. Bernadette was determined and returned with one of the priest’s friends to ask again. After she was questioned before the parish clergy and dismissed, the parish priests could not agree on what course to take. Previously, Father Peyramale had told Bernadette that the requests for the procession and chapel could not be fulfilled unless and until the lady’s name was known. At the fourteenth apparition on 3rd March she asked for the lady’s name, but the lady only smiled at her. The third time I went to see M. le Curé to tell him that a Lady had ordered me to go and say to the priests that they were to have a chapel built there, he looked at me for a moment, and then he said to me in a rather gruff tone, ‘Who is this lady?’ I answered that I did not know. Then he commissioned me to ask her name and to come and tell him. The next day when I arrived at the grotto I recited my Rosary and then asked her, from M. le Curé what her name was, but all she did was to smile. When I got back I went to M. le Curé to tell him that I discharged his commission, and her only response was her smile; then he said she was laughing at me and that I would do well not to go to her again. But, I could not help going. I came back for a fortnight. The vision appeared every day, except one Monday [22nd February] and one Friday [26th February]. She repeated to me several times that I was to tell the priests they were to build a Chapel there, and I was to go to the fountain to wash, and that I was to pray for sinners. During this fortnight, she told me three secrets which she forbade me to tell anyone. I have been faithful until now. Then I went back to M. le Curé to tell him that she had said she was the Immaculate Conception, and he asked was I absolutely certain. I said yes, and so as not to forget the words, I had repeated them all the way home. Bernadette seemed to be even more absorbed than usual in the Appearance upon which her gaze was riveted. I witnessed, as did also every one else there present, the fact which I am about to narrate. She was on her knees saying with fervent devotion the prayers of her Rosary which she held in her left hand while in her right was a large blessed candle, alight. The child was just beginning to make the usual ascent on her knees when suddenly she stopped and, her right hand joining her left, the flame of the big candle passed between the fingers of the latter. Though fanned by a fairly strong breeze, the flame produced no effect upon the skin which it was touching. Astonished at this strange fact, I forbade anyone there to interfere, and taking my watch in my hand, I studied the phenomenon attentively for a quarter of an hour. At the end of this time Bernadette, still in her ecstasy, advanced to the upper part of the Grotto, separating her hands. The flame thus ceased to touch her left hand. Bernadette finished her prayer and the splendour of the transfiguration left her face. She rose and was about to quit the Grotto when I asked her to show me her left hand. I examined it most carefully, but could not find the least trace of burning anywhere upon it. I then asked the person who was holding the candle to light it again and give it to me. I put it several times in succession under Bernadette’s left hand but she drew it away quickly, saying ‘You are burning me!’. I record this fact just as I have seen it without attempting to explain it. Many persons who were present at the time can confirm what I have said. On 8th June 1858, the mayor of Lourdes barricaded the grotto and stationed guards to prevent public access. Visitors were fined for kneeling near the grotto or talking about the grotto. 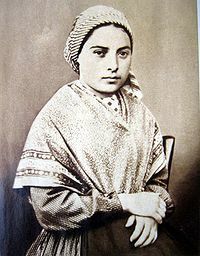 Soon afterwards Bernadette left Lourdes in 1866 to join a religious order in central France, where she died after several years of illness and terrible suffering in 1879. By the time of her death, a basilica had been built and consecrated at the apparition site, under the leadership of Fr Peyramale. Bernadette never saw herself as anything more than Our Lady’s instrument, her messenger. She shunned all attempts of people to bring her into the limelight after the events, and accepted with heroic patience and courage the great suffering, both physical and mental, to which she was subjected throughout the remainder of her life. 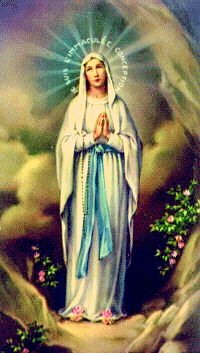 She was put through intense interrogation by Church authorities as she neared death, but remained totally calm as she confirmed her testimony of Our Lady’s appearances to her at Lourdes. She eventually died of her long-term illness at the age of 35 on 16th April 1879 (Easter Wednesday), while praying the holy Rosary. On her deathbed, as she suffered from severe pain and in keeping with the Virgin Mary’s admonition of “Penance, Penance, Penance,” Bernadette proclaimed that “all this is good for Heaven!” Her final words were, “Blessed Mary, Mother of God, pray for me! A poor sinner, a poor sinner”. Coming so soon after the 1854 dogmatic definition of her Immaculate Conception, the Virgin Mary’s appearances at Lourdes turned the town into a popular travel destination. Thousands of people say their medical conditions have been cured through pilgrimage, prayer and the water flowing from a spring to which Bernadette was directed by the Blessed Virgin. Experts have verified around 70 cases of miraculous healing at Lourdes since 1862, but there are unverified reports of thousands more, both miraculous bodily healings and, far more importantly, healings from atheism and doubts of faith. Many religious vocations have been discovered at Lourdes, and countless young people have met their future spouses at this blessed shrine, going on to form long, happy and holy marriages. Every account of the apparitions at Lourdes is very moving. This one no less so.